To Cite: Sharafi H, Nikbin M, Alavian S H, Behnava B, Alavian S M. Efficacy and Safety of Generic Sofosbuvir/Ledipasvir Fixed-Dose Combination in Iranian Patients with Chronic Hepatitis C Virus Infection, Hepat Mon. 2017 ; 17(6):e12216. doi: 10.5812/hepatmon.12216. Background: Hepatitis C virus (HCV), as a global health concern, has infected around 1.6% of the world population. Introduction of direct-acting antiviral regimens such as sofosbuvir/ledipasvir (SOF/LDV) made the treatment of HCV infection superior to previous HCV antiviral therapies in terms of efficacy and feasibility. The current study aimed at assessing the efficacy and safety of generic SOF/LDV in the Iranian patients with HCV infection. Methods: The current prospective, cohort study was conducted on patients with HCV infection referred to Middle East Liver Diseases Center in 2016. Patients without cirrhosis were treated with daily fixed-dose combination of SOF/LDV (Sobopasvir) for 12 weeks. In cases with compensated cirrhosis, patients were treated with SOF/LDV plus daily weight adjusted ribavirin (RBV) for 12 weeks. If the patient with cirrhosis was RBV-intolerant, he/she was treated with daily fixed-dose combination of SOF/LDV for 24 weeks. Results: In the current study, 30 patients with the mean age of 52.9 years were enrolled and treated with SOF/LDV. Most of the patients were male (73.3%), had cirrhosis (53.3%), infected with HCV-1a (46.7%), and had previous history of HCV antiviral therapy (62.1%). All the patients completed the course of treatment. Rapid virologic and sustained virologic responses were observed in 29 (96.7%, 95%CI = 83.3% - 99.4%) and also 29 (96.7%, 95%CI = 83.3% - 99.4%) cases, respectively. The only case of treatment failure was a relapse. No serious adverse-event was observed during the treatment course. Conclusions: The generic SOF/LDV was efficacious and safe to treat Iranian patients with chronic HCV infection. Hepatitis C virus (HCV), as a global health concern, has infected around 1.6% of the world population (1). After early acute phase of HCV infection around 30% of patients clear the infection spontaneously and the remaining 70% develop chronic infection (2). The chronic HCV infection is related to long-term sequels such as cirrhosis, hepatocellular carcinoma, and death (3). Treatment of chronic HCV infection can prevent most of the complications of long-term infection (4). Based on the sequences of nucleotides, HCV is classified into 7 genotypes from 1 to 7. In Iran, with around 0.5% prevalence of HCV antibody in general population, HCV genotype 1 (HCV-1) is the most common circulating genotype countrywide (5, 6). Treatment of HCV infection greatly changed during the recent years. With the introduction of direct-acting antiviral agents (DAAs) in 2011, the contribution of pegylated-interferon (Peg-IFN) and ribavirin (RBV) decreased in HCV antiviral regimens and with the introduction of fixed-dose combination of sofosbuvir/ledipasvir (SOF/LDV) in 2013, the treatment of HCV became interferon-free (7, 8). Sofosbuvir, an HCV NS5B polymerase inhibitor, is a nucleotide analog active against all HCV genotypes (9). Ledipasvir is an HCV NS5A inhibitor and active mostly against HCV-1 and -4 (8). In 2013, SOF/LDV fixed-dose combination was approved to treat patients with HCV-1 or -4 infection. The 12-week regimen of SOF/LDV has more than 95% efficacy in most of the patients, especially the ones without cirrhosis and/or previous history of treatment (10). The efficacy of SOF/LDV was higher than previously approved regimen of SOF in combination with Peg-IFN and RBV with around 88% sustained virologic response (SVR) rate (11). Moreover, as a result of being IFN-free, treatment with SOF/LDV is accompanied with less side events than those observed in treatment with IFN-containing regimens (12, 13). The SOF/LDV fixed-dose combination is recently manufactured in Iran as a generic drug with reasonable price to be afforded by most of the patients with HCV infection. The current study aimed at assessing the efficacy and safety of SOF/LDV in a cohort of Iranian patients with HCV-1 or -4 infection. The current prospective, cohort study was conducted on patients referred to Middle East Liver Diseases (MELD) Center in 2016. The patients with chronic HCV infection (being positive for HCV Ab and HCV RNA for more than 6 months) genotyped as HCV-1 or -4 were included in the current study consecutively. Exclusion criteria were having HCV genotypes other than HCV-1 or -4, comorbidities such as thalassemia, hemophilia, human immunodeficiency virus (HIV) infection, renal failure and undergoing hemodialysis, decompensated cirrhosis (Child-Pugh B and C), and being positive for hepatitis B surface antigen (HBsAg). Baqiyatallah Research Center for Gastroenterology and Liver Diseases approved the study design. All study participants provided written informed consent. The authors assert that all procedures contributing to this work comply with the ethical standards of the relevant national and institutional committees on human experimentation and with those of the Helsinki declaration of 1975, as revised in 2008. Patients without cirrhosis were treated with daily fixed-dose combination of SOF (400 mg)/LDV (90 mg) (Sobopasvir, Sobhan Medicine Trade Development Co, Iran) for 12 weeks. In cases with compensated cirrhosis (Child-Pugh A), a daily fixed-dose combination of SOF/LDV plus daily weight adjusted (1,000 mg for < 75 kg and 1200 mg for > 75 kg) RBV for 12 weeks was administered. If the patient with compensated cirrhosis was RBV-intolerant, he/she was treated with daily fixed-dose combination of SOF/LDV for 24 weeks. SVR was defined as undetectable result of HCV RNA, 12 weeks after termination of treatment. Rapid virologic response (RVR) was defined as undetectable result of HCV RNA at the week 4 of treatment. End of treatment response was defined as undetectable result of HCV RNA at the end of treatment course. During the treatment course, the patients were closely monitored. Complete blood cell count and liver function tests were checked at routine intervals (before starting the treatment, 1 month after the treatment, at the end of treatment, and 12 weeks after the end of treatment). Serum HCV RNA levels were quantitated before starting the treatment, 1 month after the treatment, and 12 weeks after the end of treatment using COBAS TaqMan HCV test, version 2.0 (Roche Diagnostics) with a lower limit of detection of 10 IU/mL. Cirrhosis was determined using liver transient elastography (FibroScan, Echosens) within 12 months prior to the study in 25 patients. When FibroScan was not accessible, evidence of liver cirrhosis included small liver size or irregular liver margins, dilated portal vein and/or splenomegaly on abdominal sonography, and endoscopic findings that included esophageal varices or hypertensive gastropathy. Measurement of vital signs and symptom-directed physical examinations were done in each visit at the beginning of study, 1 month after the treatment, at the end of treatment, and 12 weeks after the end of the treatment. All adverse events including nausea, vomiting, diarrhea, constipation, nasal congestion, myalgia, headache, fatigue, back pain, body pain, bleeding, abdominal pain, bradycardia, tachycardia, dermatitis, weakness, palpitation, dyspnea, reflux, insomnia, lethargy, dizziness, irritability, vision disorders, weight gain, weight loss, depression, arthralgia, flue-like syndrome, hearing and vestibular disorders, cough, alopecia, dry skin, vitiligo, pruritus, rash, chills, fever, and jaundice were recorded. Categorical variables were expressed as frequencies and percentages. Continuous variables with normal distributions were expressed as mean ± standard deviation (SD); continuous variables that deviated from normal distributions were expressed as the median (interquartile range). Statistical analyses were performed using SPSS version 20.0 (IBM SPSS). Statistical graphs were generated using GraphPad Prism version 6.0 (GraphPad software). A total of 30 patients with the mean age of 52.9 years were registered and treated with SOF/LDV fixed-dose combination in the current study. Most of the patients were male (73.3%), had cirrhosis (53.3%), infected with HCV-1a (46.7%), and had previous history of HCV antiviral therapy (62.1%). The baseline characteristics of the patients are presented in Table 1. Abbreviations: ALT, alanine transaminase; AST, aspartate transaminase; BMI, body mass index; IQR, interquartile range; max, maximum; min, minimum; N, number; SD, standard deviation. aData were missed in one patient. In the current study, 14 (46.7%) patients without cirrhosis were treated with a 12-week regimen of SOF/LDV, while among patients with cirrhosis, 15 (50%) were treated with a 12-week regimen of SOF/LDV plus RBV; 1 (3.3%) patient with RBV-intolerance with a 24-week regimen of SOF/LDV. All patients were evaluated for HCV RNA at the week 4 of treatment, at the end of treatment, and 12 weeks after the termination of antiviral therapy. Among the 30 patients, 29 (96.7%, 95%CI = 83.3% - 99.4%) had undetectable HCV RNA at the week 4 (RVR). The patient without achievement of RVR was a 46-year-old male, without cirrhosis, and treatment-naïve with 707 IU/mL HCV RNA at the week 4 of treatment. This patient achieved SVR, while he was viremic at the week 4 of treatment. Moreover, 30 (100%, 95%CI = 88.7%-100%) patients were undetectable for HCV RNA at the end of treatment. Finally, 29 (96.7%, 95%CI = 83.3% - 99.4%) cases were undetectable for HCV RNA 12 weeks after the termination of treatment (SVR). A 74-year-old male patient also had the history of treatment and cirrhosis relapsed, while he had RVR. The summary of treatment responses are presented in Figure 1. RVR, rapid virologic response; ETR, end of treatment response; SVR, sustained virologic response. In the current study, no patient discontinued treatment as a result of treatment adverse-events. Ribavirin-induced anemia was observed in 7 (23.3%) patients and resulted in RBV dose reduction in 4 (13.3%) patients. Treatment-related thrombocytopenia was observed in 3 (10%) patients. The other observed treatment adverse-events were mild to moderate fatigue, myalgia, nausea, vomiting, headache, and weakness; each was observed in less than 10% of patients. The treatment adverse-events are presented in Table 2.
aAbdominal pain, alopecia, arthralgia, back pain, bleeding, bradycardia, chest pain, chills and fever, constipation, cough, depression, dermatitis, diarrhea, dizziness, dry skin, dyspnea, flue-like syndrome, hearing disorders, insomnia, irritability, jaundice, lethargy, nasal congestion, palpitation, pruritus, rash, reflux, tachycardia, vision disorders, vitiligo, weight gain, weight loss. The current study found that treatment with a generic SOF/LDV fixed-dose combination resulted in more than 95% treatment success in patients with chronic HCV infection. Moreover, treatment with generic SOF/LDV was not accompanied by serious adverse events and the treatment was tolerated in all of the patients. Treatment of chronic HCV infection is necessary to prevent the long-term consequences such as cirrhosis and hepatocellular carcinoma (7). Every patient with positive result for HCV RNA is a candidate for HCV antiviral treatment, especially in the era of DAA agents with the presence of IFN-free regimens suitable for different conditions of patients with HCV infection such as liver or kidney transplanted patients, patients with chronic renal failure or undergoing hemodialysis and decompensated liver disease (8). 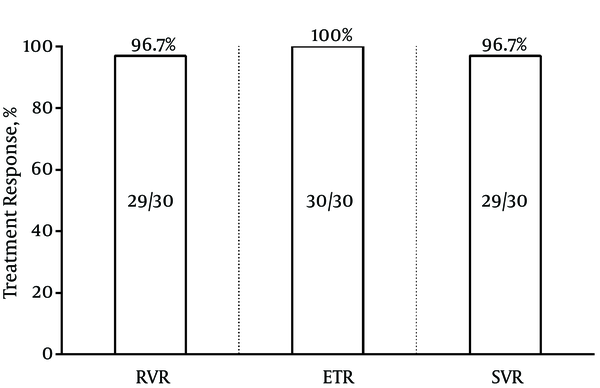 In the current study, the rate of SVR was 96.7% in patients treated with SOF/LDV. In the previous clinical trials of SOF/LDV, the rate of response to SOF/LDV was 64% to 98% (12-15). In fact, the different treatment response rates to SOF/LDV treatment observed in the studies were resulted from different conditions of patients such as the presence of cirrhosis, decompensated liver disease, previous history of antiviral therapy, the presence of resistance-associated substitutions (RASs), and different treatment strategies such as adding RBV to treatment or the 24-week prolonged treatment. In a meta-analysis, the overall treatment response to fixed-dose combination of SOF/LDV was 95% for 12-week SOF/LDV, 97% for 24-week SOF/LDV, 96% for 12-week SOF/LDV plus RBV and 98% for 24-week SOF/LDV plus RBV (10). Most of the studies included the latter meta-analysis harbored patients with cirrhosis as a fraction of the study population. As a result, based on the results of the mentioned meta-analysis and those of the current study, it can be concluded that with optimized SOF/LDV regimen in a population of patients with chronic HCV infection, excluding decompensated liver diseases, the treatment response to SOF/LDV would be more than 95%. In the IFN-based regimen era, a number of baseline parameters such as gender, age, cirrhosis, previous history of treatment, body mass index (BMI), HCV RNA level and IFNL3 polymorphisms impacted the rate of treatment success (16-19). In the current study, the only case of treatment failure was a patient with cirrhosis and previous history of treatment. The treatment failure to cirrhosis and previous history of treatment could not be directly associated, based on the current study observation; however, the large-scale studies showed the impact of such parameters on IFN-free regimens (12, 13). The meta-analysis by Rezaee-Zavareh et al. showed the significant impact of cirrhosis and borderline impact of previous history of treatment on treatment failure in the regimen of 12-week SOF/LDV. This meta-analysis, also found that NS5A RASs decreased the rate of SVR in patients treated with SOF/LDV (10). Based on these findings, experts and guidelines recommended to intensify the treatment by adding RBV or prolongation of treatment to a 24-week course when patient harbor cirrhosis and/or previous history of treatment and/or NS5A RASs (20). The on-treatment response was the most important predictor of response of SVR in the IFN-based regimens; however, with the introduction of highly efficient IFN-free DAA regimens, the importance of on-treatment response faded (21-23). In the current study, the only case with viremia at the week 4 of treatment achieved SVR; however, large-scale studies are needed to clarify the importance of on-treatment response in clinical decision-making in the IFN-free regimens era. In terms of treatment adverse-event, treatments with IFN-free regimens are accompanied by fewer adverse events in comparison with those of IFN-based regimens (12-14). In the current study, the treatment with SOF/LDV was accompanied by few mild to moderate adverse-events such as fatigue, myalgia, nausea, etc., which was in line with the previous clinical trials of SOF/LDV. In conclusion, the regimen of SOF/LDV was efficacious and safe to treat chronic HCV infection in Iranian patients and the generic form of the regimen can be used as an alternative to the brand name drug of SOF/LDV with the same rate of response and much lower cost to treat each patient. With the availability of these generic DAA regimens the elimination of HCV infection in Iran is possible by 2030. The authors express their special appreciation to the staff of the MELD Center and MELD Virology Laboratory. Authors’ Contribution: Study concept and design: Heidar Sharafi and Seyed Moayed Alavian; acquisition of data: All authors; statistical analysis and interpretation of data: Heidar Sharafi and Seyed Moayed Alavian; drafting of the manuscript: Heidar Sharafi; critical revision of the manuscript for important intellectual content: Seyed Moayed Alavian; study supervision: Seyed Moayed Alavian. All authors read and approved the final version of the manuscript. Funding/Support: This study was funded and supported by Sobhan medicine trade development company, Iran. Conflict of Interest: Authors declared no conflict of interest regarding this study.